The journal AT INTERNATIONAL – Mineral Processing has been informing its reader-ship for more than fifty years on developments and solutions to problems in mechanical process-engineering in the fields of minerals, coal, ores and secondary materials, such as construction or demolition (“C&D”) waste, and power-plant by products. The subjects covered include both technical, scientific and economic topics associated with the processing stages of comminution and agglomeration, screening and grading, sorting, dewatering and drying, materials handling, conveyance and storage, homogenization, blending and proportioning, sampling and quality monitoring. These are augmented by monthly spotlight features from the individual sectors, such as salt and potash, trends in coal preparation, and overviews focused on specific countries. Brand-Service. Special Projects company issues and guarentees targeted distribution of reference maps and calendars among manufacturing enterprises in CIS, West Europian, Middle East countries. Reference maps contain information about geographical location, specialization, operational indicators of CIS and Baltics manufacturing companies. ЦАГС является некоммерческой организацией, объединяющей на добровольной основе физических лиц, содействующих развитию горной промышленности Центрально-Азиатского региона, достижению передового уровня экологической безопасности окружающей среды, условий труда работников, занятых в этой отрасли промышленности, способствующих рациональному использованию недр и понимающих ответственность перед потомками за принимаемые решения, сознающих необходимость и добивающихся согласования интересов инвесторов, государств, недропользователей и занятых на предприятиях трудящихся, поддерживающих престиж горных профессий, готовых к выработке согласованных действий и политики в процессе продвижения продукции, товаров и технологий на рынках сбыта. В настоящее время ЦАГС объединяет свыше 300 известных предпринимателей, ученых и производственников, занятых в сфере недропользования. Central Asia Newswire covers the five countries of Central Asia with a primary focus on business and economic news. Based in Washington, DC, as part of Universal Newswires, the daily newswire on the region is supplemented by weekly newswires covering Kazakhstan, Kyrgyzstan, Tajikistan, Turkmenistan and Uzbekistan. Hosted by China Ministry of Land & Resources, Tianjin Municipal Government and China Mining Association, the 15th annual CHINA MINING Conference and Exhibition will be held at Tianjin Meijiang Convention Center from November 2nd to 5th, 2013. Since the first time CHINA MINING was held in 1999, the scope and influence has been extending every year. CHINA MINING Conference and Exhibition has become an annual not-to-miss event and a platform to meet the world mining players. CHINA MINING 2012 has concluded with great success – 420 exhibitors and 6000 delegates from 55 countries joined CHINA MINING 2012. Besides the conference and exhibition, CHINA MINING also features coherent events, such as Awards Dinner, Signing Ceremony of project investments, Government Welcome Dinner and additional Cocktail Reception, Lunch & Coffee Break function to offer various networking opportunities for participants. Since 1997 we have been developing our expertise and market connections to provide commodity market professionals and the wider investment community with dedicated research and intelligence on the commodity complex. As well as the published magazine, our online presence – commodities–now.com – provides updated news, key press releases, data, charts, research and reports dedicated to these markets. Commodities Now covers: Power & Energy, Industrial & Precious Metals, Agriculture & Softs, Renewable Energy, Emission Markets, Commodity Logistics, Legal, Regulatory Policy, Research & Specialist Technology. International industrial magazine The magazine regularly covers not only actual questions of all complex of ferrous, non-ferrous and precious metals, but also lifts problems of branch, regions, economy and industrial development of Russia. Euroasia Industry magazine is a quality, monthly publication that provides 250+ pages of insightful comment and analysis of today’s foremost business developments, encompassing international trends in trade, market challenges and technological innovations. Mining, Metals & Minerals are key sectors featured in the magazine, and we speak to successful companies from around the world about their achievements to date, current and upcoming projects, and strategies for future success. Technology is making the world a smaller place, globalisation is a fact of life, and we continue to bring our senior executive readers the very best of the international business community. Goldletter International, based in Amsterdam, the Netherlands, is a premier independent information source on investing in the worldwide gold and uranium sector. Goldletter International is particularly featuring emerging gold regions in the world, including Russia, Central-Asia, China, Mongolia, Latin-America and West-Africa, as well as Canada and the US. Special Region Reports include overviews of exploration/development companies active in these regions, and reports on individual companies featured as a Special Situation. «Gornaja Promyshlennost» is an international specialized scientific and technical trade journal dedicated to the progress and latest engineering developments in mining, mining engineering and processing equipment, modern computer systems, scientific studies, R&D, state of the mineral resources market, experience in investments into mining both in the FSU countries and abroad. It has been published bimonthly since 1994. Publishing house «Gornaya kniga» has been issuing reference and scientific books about such disciplines as mining, geology, mine surveying, geodesy, geophysics, ecology, economy for more than two decades . Several years ago new editorial staffs for construction, atomic engineering, oil and gas appeared in the publishing house. Ежемесячный научно-технический и производственный журнал – старейшее в мире (основан в 1825 г.) периодическое издание в области горного дела. Тематика журнала охватывает все аспекты горного дела в области добычи и переработки твердых полезных ископаемых (руды черных и цветных металлов, горно-химическое и промышленное сырье, строительные горные породы, природный облицовочный камень и др.). Практикуется выпуск специальных номеров журнала по горнопромышленным комплексам стран СНГ, федеральным округам России, отдельным субъектам РФ и крупным горным предприятиям. InfoMine (www.InfoMine.com) is the world leader in the provision of mining knowledge online via a suite of websites and email. Find mining facts, figures and opinions. Subscribe to in-depth, up-to-date mining and mineral exploration databases, track news, explore career opportunities, take online courses, determine mine costs, locate suppliers and more. Interfax-Kazakhstan News Agency, part of the international group Interfax Information Services, has been working on the political and economic information market since 1996. Interfax-Kazakhstan issues daily operative news products in Russian, English, Kazakh and also sectoral reports. 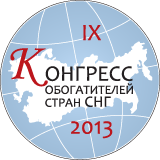 The IX CIS Congress of the Mineral Processing Engineers will be held in the Congress hall of the World Trade Center (Krasnopresnenskaya embankment, 12, entrance 4, Moscow, Russia) from 26 to 28 February, 2013. The main Congress’s organizer is the Department of Extraction of Non-Ferrous, Rare-Earth and Precious Metals of The National University of Science and Technology MISiS. Published since 1991, (bi-monthly) The Journal publishes materials on all types of minerals, oil, gas, coal, ferrous, non-ferrous, precious and rare metals, agrochemical and mining chemical raw materials, etc. The basic sections: the current state and development prospects of the mineral resource base in Russia (exploration and the resources base); economic policy and management of the mineral resource complex; legal support to subsurface use; mineral resources market; investment projects, equipment and technologies. Kapital Publishing House Ltd. is delighted to offer you cooperation in field of advertisement and promotion of your product (service) in all regions of Kazakhstan through nationwide business publications Business.KZ and Industry. Kapital Publishing House includes nationwide magazine Industry and nationwide newspaper Business.KZ; it is an official partner of such exhibition and conference organization companies as Iteca, ТНТ, KAZEXPO, Fair Expo, Astana Expo. Due to long-term cooperation with the companies, the publications participate in all events (expos, conferences, workshops) on various themes of industry development. ОО «Ассоциация развития малого и среднего бизнеса «KAZadvancement» – общественная организация руководителей предприятий, бизнесменов и общественных деятелей Казахстана, созданная 23 ноября 2010 года. Mission of the magazine – Helping leaders of Kazakh business expand their business relations and promote successfully in local and international markets. Being a publication for professionals, this magazine only publishes accurate and quality analytical material in the sphere of business and investment. information services for the energy and subsoil use sectors. With the advantage of being the first and till recent the only independent mining publication of Turkey, Madencilik Türkiye Magazine (MTM), which is being published since September 2009, has attained a respected estate in the sector in a short time. Being the unique magazine in the sector with its widespread distribution network and numerous readers, Madencilik Türkiye provides an unequalled media to the companies for their advertisements. Thus advertisers can reach directly to their target customers in the mining sector. MTM targets mainly the private sector and distributed more then 2000 unique address. In addition to the Turkish publication, “Mining Turkey Magazine”, the english edition with different content, is also published biannually. “Bulletin of Mining Concessions”, free supplement of the MTM, has been serving to the investors who are looking for finance/partners to their mining concessions or projects – since October 2010. Metal Bulletin is the premium intelligence service for metals and steel professionals everywhere. Covering all global metals and steel markets, it provides a comprehensive package of the latest news, pricing information, expert market commentary and statistics. Metals covered in detail include carbon steel, stainless and special steel, scrap and secondary, ores and alloys, raw materials, minor and precious metals and base metals with additional coverage of freight news, capital markets and exchange news and prices. Publication of scientific-technical and industrial specialized journal “Metallurgicheskaya i Gornorudnaya Promyshlennost”. The journal has been published for more than 50 years and covers the problems of mining and smelting industry of Ukraine, scientific and technical results of institutes and enterprises, new technologies equipment, products. Каталог Минералов: всё о драгоценных камнях и минералах! Наш каталог – это виртуальная коллекция минералов и драгоценных камней. На сайте вы найдете фотографии, описания и тематические статьи по минералогии и истории камня. Минералов на свете великое множество, а потому охватить сразу все практически невозможно. Мы стараемся сделать наш каталог наиболее полным и информативным, а потому постоянно обновляемся. Mining Job Search Ltd have delivered an industry leading worldwide site for mining professionals, connecting recruiters to suitable candidates and candidates to suitable positions. The site uses cutting edge technology that has been tried and tested on our flagship site – www.oilandgasjobsearch.com. Registration is quick and easy with the option of free daily relevant job alerts direct to the candidate. Mining Journal Founded in 1835, Mining Journal and Mining Journal.com is the only truly global source of mining intelligence. With over 20,000 readers in print and more than 30,000 unique online readers per month, Mining Journal reaches the top decision makers, prominent industry players and mining professionals in 203 countries worldwide. Mining Turkey started to be published at September 2011, as a supplement of Madencilik Türkiye Magazine. In it’s first issue, with it’s diverse content about Turkish Mining Industry, Mining Turkey became an important guide for foreigner executives and engineers who lives or plans to invest in Turkey. Mongolian Economy aims to publish Mongolian economic, financial and business news truthfully, with the intention to educate the population on economics and finance. Our focus is to develop a standard of professional journalism that is independent from politics and outside economic influences. The magazine publishes bi-monthly (every 14 days) in both Mongolian and English languages. Журнал «Разведка и охрана недр» – это многоплановый научно-технический журнал. На его страницах публикуются материалы в области геолого-геофизических исследований, технологии поиска и разведки полезных ископаемых. Многоплановость поднимаемых проблем и высокий уровень публикуемых материалов делают журнал интересным геологам, геофизикам, гидрогеологам, геохимикам, буровикам и др. Постоянные публикации руководителей отрасли позволяют быть в курсе основных задач, стоящих перед специалистами отрасли. Interbranch scientific technical journal “Subsoil using – XXI Century” The official journal of the Society of Russian Experts on Sub soil using (OERN). Information Partner State Duma Committee on Natural Resources, Environment and Ecology, Federal State Institution “State Commission for Mineral Reserves.” Founder – Non-commercial partnership “Self-organization” National Association for the subsoil use auditing”. Magazine ” Subsoil using – XXI Century ” highlights the most successful and effective solutions in the field of geological exploration, mining and minerals processing, comments on legislative and regulatory aspects of the subsoil. The Canada Eurasia Russia Business Association has a network of seven chapters located in Moscow, Toronto, Montreal, Ottawa, Calgary Vancouver and Almaty, and a membership base of over 200 corporations and individuals in a wide range of sectors. As an association, CERBA provides an extensive network of contacts with frequent networking events, informative seminars on pertinent topics in the Eurasian market for Canadian companies, an annual National Conference, a quarterly printed Newsletter, committees of the Canada-Russia Business Council (CRBC), access to annual trade missions, as well as market intelligence, advocacy on government policy, and active, Canada-focused sector committees. The Institute of Materials, Minerals and Mining (IOM3) exists to promote and develop all aspects of materials science and engineering, geology, mining and associated technologies, mineral and petroleum engineering and extraction metallurgy. It is the professional body for the international materials, minerals and mining community, providing information and library services, conferences, workshops, publications, and various educational resources. The Institute assists its members in achieving the prestigious Chartered Engineer, Incorporated Engineer, Engineering Technician, Chartered Scientist or Chartered Environmentalist professional qualifications. IMMa, the International Mining & Minerals Association (part of IOM3), serves Institute members with interests in the mining and minerals industries and provides a focus for the worldwide community of minerals professionals. Tradelink Publications Ltd is a publisher of leading journals for the mining and quarrying industries. Its publications include: Mining World: a bi-monthly journal distributed worldwide, with editorial content covering exploration, extraction and processing methods for all kinds of minerals. Coal International is a global, bi-monthly publication for the coal mining industry, reporting on worldwide news and developments together with plant and equipment, and distributed to coal mining operations worldwide. We also publish Coal International in the Chinese, Polish and Russian languages to coincide with exhibitions in these countries. World Finance Review is a quarterly publication dedicated to promoting investments into emerging economies. For a number of years World Finance Review has been working with Governments and National Banks to attract international businesses and to foster direct investments inflow into Eastern Europe and Central Asia. World Finance Review strives to provide accurate and objective information and cutting edge analysis of trends and developments in economy, banking and finance, oil and gas, technology and innovations, investment climate and environmental issues. Бюллетень «Горнопромышленные ведомости» – информация для тех, кто принимает решения! Наша задача: оперативно предоставлять горнопромышленному бизнес-сообществу объективную, качественную и полезную информацию, необходимую для принятия важных решений в горной промышленности. Информационно-аналитический ресурс о горной промышленности. Самый посещаемый в России. Девиз – новости, факты, комментарии.